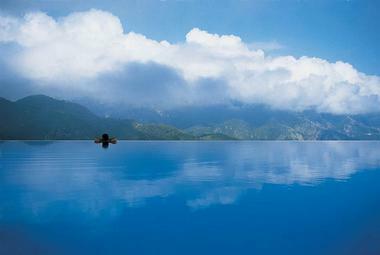 Picture yourself sitting down next to a scenic blue pool, the sun warming your body, surrounded by an incredible view. 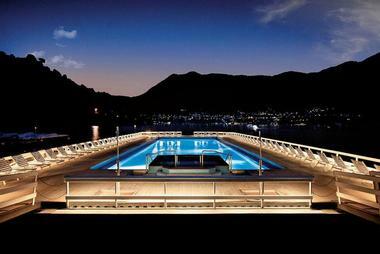 Each resort pool that made our list is unusual and unique, featuring creative design and spectacular views. Most are infinity-edge pools either high on a cliff above the water or right on the beach, so close to the sand that you can almost touch it. Picture yourself sipping a cool drink at the pool bar or having a relaxing lunch while enjoying the view. Choose from destinations around the world, including Europe, California, Mexico, the Caribbean, Maldives, Bali and other popular vacation spots. Perched high above the ocean, Katikies lets you admire some of the most unbelievable island scenery in Greece. Resort suites have their own private outdoor jacuzzis with awesome views. 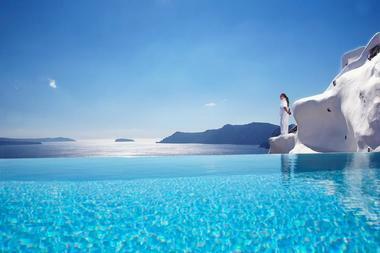 Katikies is set against the dramatic and romantic backdrop of Santorini, one of Greece's most celebrated islands. Katikies is located in Oia, a city known for its whitewashed walls, cobblestone alleyways, and bright blue rooftops. Katikies offers seven different types of luxurious rooms and suites. Each room gives visitors the best that Oia has to offer: endless sea views as well as glimpses of Santorini's soaring cliff tops. 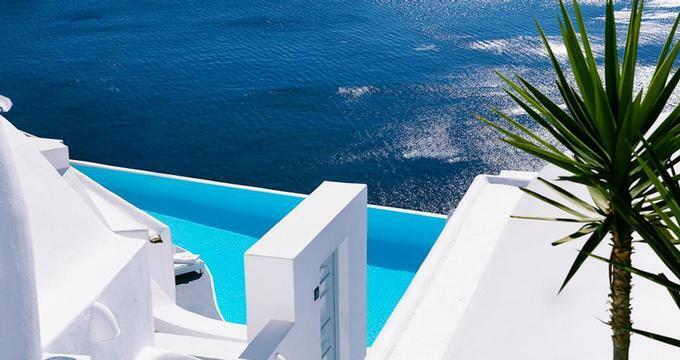 Amenities include three infinity pools whose edges seem to spill into the cobalt sea, a spa that offers treatments specially tailored to your desires, and an upscale restaurant with fine Greek cuisine. Located at the tip of Baja Peninsula, Las Ventanas al Paraiso literally means the "Windows to Paradise". This is the perfect spot to relax with some of the most amazing ocean views. This stunning resort consists of both suites and villas. Each suite has its own large patio as well as nearly 1,000 square feet of beautifully furnished living space. All of the villas offer unobstructed ocean views, and some of them are located just a few feet from the sparkling sea. Guests enjoy round-the-clock room service, deluxe complimentary toiletries, and full access to the resort's wellness center. Las Ventanas al Paraiso also has a built-in spa and salon where guests can indulge in everything from a manicure to a complete light and sound therapy session. A set of butlers attend to poolside visitors, and they give their all to ensure everyone is well-fed, pampered, and comfortable. The architects of the Banyan Tree Seychelles love ocean vistas. You will find private pools in every luxury villa at the resort. This luxury resort sits in the Intendance Bay area of Seychelles, an exotic archipelago off the coast of East Africa. Banyan Tree has a collection of villas replete with ocean views. Some of the villas sit directly on the sand, and others have their own infinity pools. King-sized beds, plush loveseats, a sunken bathtub, and a spacious kitchen and dining area are included in each luxurious villa. Guests can collaborate with the Banyan Tree staff to schedule tours to nearby organic farms, the famously beautiful island of La Digue, and the turtle nests at Anse Intendance. After a day of sightseeing, guests can dine in the Banyan Tree's fine restaurant and unwind with a series of holistic treatments at the Banyan Tree Spa. The secluded Coco Bodu Hithi Maldives is home to this beautiful spot on the ocean's edge. With its wide selection of dreamy beachfront and over-the-water bungalows, the Coco Bodu Hiti is the ultimate destination for experiencing the beauty and luxury of the Maldives. 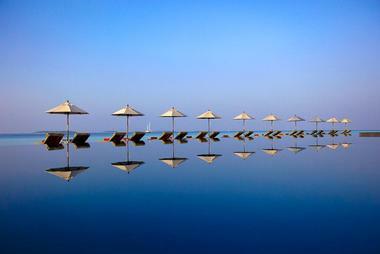 Infinitely blue waters surround each of the 100 idyllic villas. Comfortable king-sized beds, a personal bar, and beautifully landscaped outdoor living areas are just a few of the treats that await guests at this upscale resort. The Coco Bodu Hiti has seven restaurants of its own, and guests can even enjoy a delicious barbecue on the beach at sunset. The built-in Coco Spa offers a series of relaxing and restorative treatments rooted in Southeast Asian and Middle Eastern culture. Lastly, the resort has an array of activities for guests such as snorkeling, sea excursions, and trips to Mahe, the capital city of the Maldives. Hanging over a cliff in Italy, Belmond Hotel Caruso lets you enjoy some of the most beautiful views of the Amalfi Coast. Situated in an 11th century palace, Belmond Hotel Caruso appears to drift over the tranquil Mediterranean Sea. The hotel has a total of 50 double rooms, junior suites, suites, and exclusive suites that are exquisitely decorated. The hotel's built-in restaurants look out onto panoramic views of the sparkling sea and rugged hilltops. 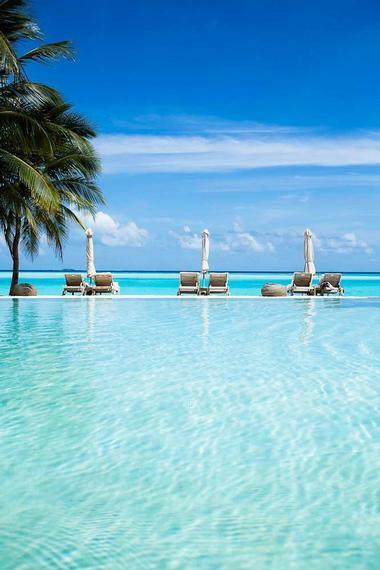 While relaxing in the Hotel Caruso's stunning infinity pool, guests can enjoy their favorite songs on an iPod provided by the concierge or savor something refreshing from a heaping bowl of fresh fruit. The hotel also provides guided boat tours of the breathtaking Amalfi coastline, and guests can entertain themselves at the Belmond by visiting the spa, the fitness center, or the upscale boutique. The Belmond Hotel Caruso is also child-friendly. Parents can request a babysitter if they want some time alone, and the spa offers special treatments for kids and teens. The pool at the Post Ranch Inn in Big Sur, California makes you feel like you are levitating over California's spectacular coastline. Post Ranch Inn is a romantic weekend getaway, located on Pacific Coast Highway One in Big Sur, California.The property features wonderful architecture and spectacular views. Book one of the Ocean Houses with incredible ocean views and a wood-burning fireplace. Fill the indoor spa tub, order room service and you will not want to leave your room while staying at this famous Californian weekend retreat. The property is located on 98 acres, perfect for hiking, picnicking and romantic walks. There is a heated outdoor pool, fitness area and a private massage studio. The inn offers a number of weekly complimentary guest activities such as yoga, nature and garden walks. Stargazing is offered on clear nights. Guests can schedule a private yoga or fitness class, followed by a relaxing massage or health spa treatment. Treatments include aromatherapy, La Stone Therapy, herbal wrap, facials, reflexology and Reiki. Massage can be arranged on the deck or in a private massage studio. There are 30 luxury guest rooms located in several unique houses. The seven Tree Houses are built nine feet off the ground on stilts with a stairway leading to each entrance. Tree Houses are triangular in shape with a window seat, desk and a fireplace. The ten Coast Houses were designed to resemble the nearby redwood trees and offer partial or full ocean views. The five Ocean Houses offer amazing ocean views from the bed, bath, window seat and terrace. The two-sided fireplace in an Ocean House is visible from the bed and bath. Guest accommodations feature a fireplace, massage table, indoor spa tub, private deck and a free mini bar. A Neapoliton palace that dates back to the 1700s is the home of the Capri Palace Hotel & Spa, a luxurious resort on the island of Capri. This 5-star hotel includes 72 suites as well as three restaurants and an internationally acclaimed medical spa. The historic village of Anacapri is within walking distance of Capri Palace, and guests can also buy exquisite Italian clothing and jewelry from the Palace's specialty shop. The built-in White Museum showcases a variety of fine Italian pieces that reflect the creativity and style of the museum's founder, Tonino Cacace, as well as other famed artists. The hotel also offers exhilarating speedboat excursions to neighboring islands. Lastly, guests can reserve portions of the Capri Palace Hotel & Spa for weddings and special events. Gili Lankanfushi is a resort comprised of luxurious over-the-water villas in the Maldives. Each villa has an open floor plan with a private coral garden and floor portholes that give guests a glimpse of the clear ocean below. Upon arriving at the resort, each guest is escorted to their private accommodations by boat. At Meera Spa, guests are treated to professional massages, and local Tibetan bowl drummers create a tranquil mood with their delicate music. To entertain guests, the Gili Lankanfushi has its own jungle cinema, equipment for a variety of exciting watersports, and plenty of areas for swimming and snorkeling. The resort also has its own organic garden that provides nearly 60 percent of all the vegetables used in the on-site restaurants. With 79 beach and over-the-water villas, Anantara Kihavah Villas is the perfect spot for a relaxing holiday. The sprawling resort caters to guests' needs with its state-of-the-art fitness center, yoga and meditation classes, watersport equipment, and areas for teens and kids. One of the resort's most stunning features is its quartet of restaurants: Sea, Fire, Salt, and Sky. The Sea restaurant is submerged and gives guests incredible views of life in the Indian Ocean, while the Sky restaurant features a rooftop bar with expansive views of the horizon. There are plenty of opportunities for guests to dive or snorkel in the stunningly clear waters that surround each isolated villa. Adventurous visitors can charter a Maldivian seaplane for a romantic afternoon on a desolate sandbar or to capture photos of the incredible seascape from high above the clouds. Accessible only by speedboat, Velassaru Maldives is a secluded island in the middle of the Indian Ocean. Couples who want beautiful sandy beaches, romantic tropical sunsets and great service, should head to the Maldives. 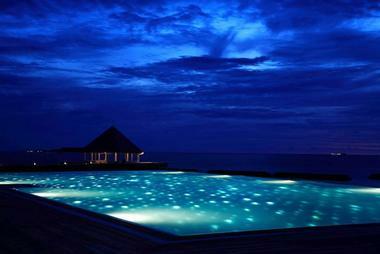 Guests are accommodated in beach bungalows and water villas with modern interiors and minimalist traditional exteriors. All guest accommodations provide the following amenities: In-villa safe, LCD TV & DVD player, Private bar and tea & coffee maker, IDD Telephone, internet access, Bathrobes, hair dryer, ceiling fan and individually controlled air-conditioning. Velassaru Water Suite is the most spacious and luxurious, complete with a glass bottom floor with a views of marine life swimming underneath you. Outside you will find a spacious deck area with steps leading directly into the blue lagoon. At night, the starry sky above is spectacular. During the day, the views of the surrounding reef and ocean and fabulous. The property has its own Dive Center where you can take diving lessons, a Watersports Center, a fitness center, tennis court and yoga. Try severalfun activities on your honeymoon such as glass-bottom kayaking over the reefs, wake boarding and windsurfing. Sign up for a couples' massage in one of the unique overwater treatment pavilions on stilts over the lagoon. Velassaru Spa has a soothing relaxation room, 10 overwater treatment rooms, a yoga pavilion, steam room, sauna room and a hydro pool over the lagoon. Choose from one of the signature spa packages for the ultimate indulgence on your honeymoon. Click here for more great spas. From a private dinner on the water's edge to intimate dining at Etesian, the resort gives couples many great options. Flavors from around the world include Mediterranean, Eastern, Indian and Continental cuisines in several distinct settings. The resort offers two great beach bars. Honeymoon packages start from US $482 and include: boat transfers for two, champagne, dinner, massages and yoga (+960-665-6100). 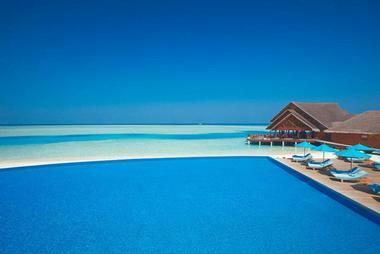 Huvafen Fushi Maldives sits at the edge of the ocean, offering 360 degree views of the coral reef and the sandy beach. Guests at this luxury resort can choose from several types of accommodation, including beach bungalows with private pools as well as luxury over-the-water bungalows. For the most authentic experience, some guests choose to stay in a Dhoni. Guests who select this option aren't sacrificing luxury for authenticity—the Dhoni has its own full-time staff, an onboard chef, and living quarters furnished with all the latest amenities. Back at the resort, there are several specialty restaurants that serve fine cuisine from all locales. Dining on a deserted sandbar or enjoying a meal in the infinity pool is also an option with the resort's destination dining services. Snorkeling, diving, seaplane flights, and marine conservation tours are just a few of the activities that guests can enjoy during their stay. 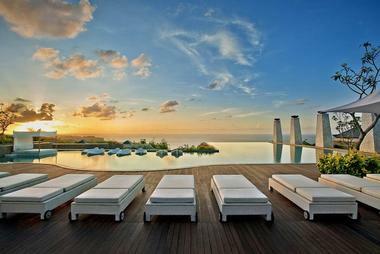 Watch a spectacular sunset in Bali at Banyan Tree Ungasan. Plush white lounge chairs and a giant daybed surrounded by water inspire dreams of relaxation in the tropics. Banyan Tree Ungasan is a beautiful hideaway in Bali, set on a cliff overlooking the Indian Ocean. The resort has a white-sand beach, relaxing spa and five star villa accommodations. The elegant villas each come with a private pool and an outdoor relaxation area, letting you experience the best of outdoor living in Bali. If you are on your honeymoon, book the Cliff Edge Ocean View Pool Villa which offers spectacular views of the water. 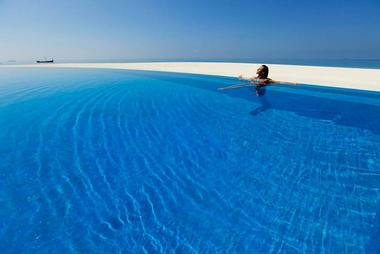 The infinity edge pool in this villa makes you feel like you are floating above the ocean. In addition to the pool, the luxury villa has a jet pool and a Balinese bale. Interiors include a separate living room, pantry, marble bathroom and a BOSE stereo system. There is a complimentary wireless internet connection. The resort is surrounded by ancient Balinese temples, beautiful nature and fabulous beaches. Take a bike tour of Ungasan village or a nature walk accompanied with a local guide. The spa has opulent treatment pavilions and a range or Asian treatments designed to rejuvenate the mind and the body. Enjoy fabulous views of the surrounding nature through huge windows. Treatment suites have relaxing baths and spacious layouts, perfect for couples' massages. Rates at Banyan Tree Ungasan start at USD 568 per night. You may also like: 24 Most Outrageous Ocean Views from Your Hotel Bed and 15 Breathtaking Overwater Pools. 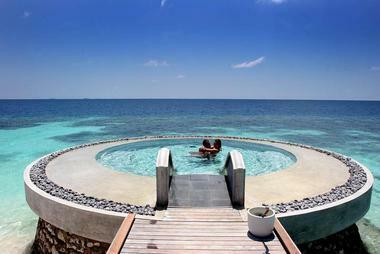 Anantara Dhigu is inches away from the blue lagoon that surrounds this dream getaway. The resort features 110 pristine over-the-water bungalows that include high-end amenities and offer gorgeous ocean views. Professionals pamper guests at the Anantara Spa, a premiere spot for holistic therapy and treatments. Guests can dine at eight fine restaurants, each of which has a unique menu. To stay busy during the day, Anantara Dhigu arranges exhilarating tours that include diving, snorkeling, parasailing, kayaking, or windsurfing. The resort also allows guests to charter boats for expeditions to deserted atolls and distant coral reefs. Dhigu Anantara is child-friendly and offers plenty of fun activities for teens and kids. 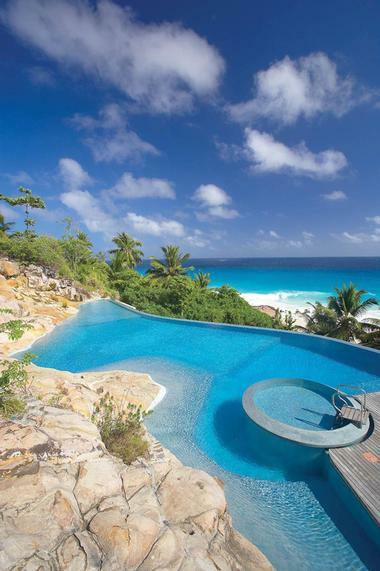 The free-form infinity pool on Fregate Island in the Seychelles is elevated above the beach and the ocean to offer the most scenic views. Conservation and relaxation are the main goals of this beautiful island resort. With seven private beaches, a world-class PADI dive center, and a reputation for saving and protecting thousands of turtles and birds, Fregate Island is a premiere luxury travel destination. Private residences, hillside estates, and even an entire section of the island are available as guest accommodations. The island has a host of restaurants with dishes to please any palate. Guests can eat their meals high up in the island tree house or out at sea during a sunset cruise. During the day, visitors can find entertainment in taking nature walks with professional conservationists, hiking on mountain trails, or working with a trainer in the resort's fitness center. Stargazing trips are also available for evening entertainment. 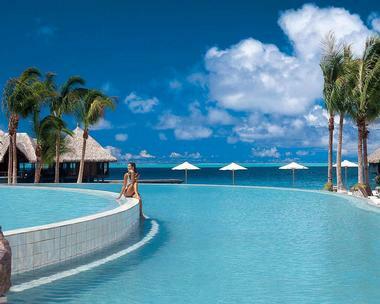 The pool at the Hilton Bora Bora Nui has two levels and curves that skirt the sandy resort beach. Order a drink at the bar and enjoy views of the Bora Bora lagoon. Bora Bora Nui Resort & Spa is a luxury villa vacation getaway in Bora Bora, French Polynesia. Spend your days relaxing surrounded by the blue waters of the South Pacific, getting pampered at the spa and enjoying outdoor adventures on your luxury vacation. The resort has a large swimming pool, fitness center and Mandara Spa with panoramic views of the islands. For ultimate relaxation, book a treatment in one of the private bungalows with a Jacuzzi and full bathroom. 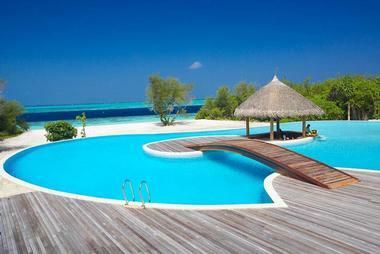 This swimming pool at the Dhonakuli Maldives has curved edges and a wooden bridge leading to the swim-up bar. Guests have a choice of walking or swimming to the bar to pick up their drinks. 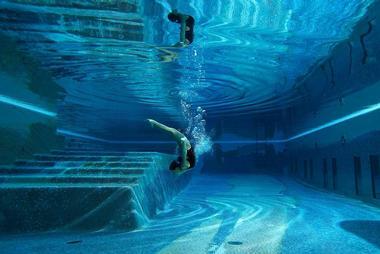 Swim laps and enjoy the views under and above water at Laucala Island Resort. Laucala was just added to the Leading Hotels of the World, a prestigious collection of luxury hotels. 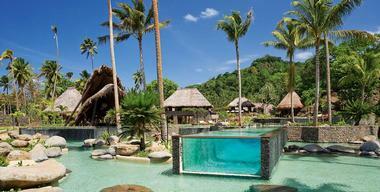 The resort was once owned by the Forbes family and became the largest private island resort in Fiji a few years ago. The self-sufficient getaway has its own farm, blue lagoon with a coral reef, a spectacular golf course, several uniquely designed swimming pools and just 25 luxury villas. Your privacy is virtually guaranteed and you can be completely undisturbed. Honeymooners can take romantic walks along the sandy beach, go scuba diving and get couples treatments at the luxury spa. In the evening, the resort can set up a romantic candlelight dinner on a private beach where you can dine under a starry night sky. There are numerous dining options to choose from. Plantation House Restaurant is the signature restaurant serving a varied menu of international dishes. Seagrass Restaurant serves primarily Asian cuisine. Head to the Rock Lounge for delicious cocktails at sunset. During the day, enjoy snacks at the Pool Bar or barbecue at the Beach Bar. Most of the produce and poultry is grown on the island which means that it's as fresh as it gets. There is a wine cellar with top vintages from around the world. You don't come across a private island with a golf course very often. The resort features a 18-hole championship golf course with spectacular views of the Pacific Ocean, natural rock formations and green mountains. The golf course features demanding fairways, well-developed greens and elaborately situated bunkers which means that you will have to play another round until you get it right. The resident pro is available for private lessons. 25 luxury villas feature original artwork, custom furniture and unique layouts. Whether you want to be on stilts over the blue lagoon, higher up on the hill, or on the sandy beach, the resort can accommodate your preferences. Villas on the hill are surrounded by lush tropical foliage. They are great for honeymooners who want to stay in and order room service. Nightly rates at Laucala start at US$ 3,800 for a one bedroom villa. Included in the rate are all meals and activities. Le Meridien Tahiti has a sandy bottom, perfect for vacationers who want to keep their feet in the sand all day long. 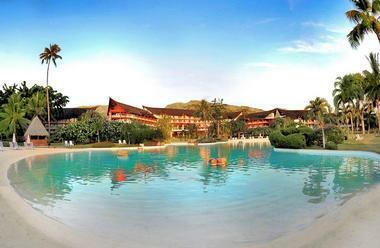 Le Meridien Tahiti is located in the Punaauia region of Tahiti, French Polynesia. The resort offers a swimming pool with a white sandy bottom, a sandy beach and a range of watersports, including snorkeling, kayaking and beach volleyball. Because of its scenic location, the hotel gets our vote as one of the best tropical honeymoon spots. Since there are direct flights to Tahiti from many international destinations, getting to the resort is easier and takes less time than traveling to the outer islands of French Polynesia. In the hotel main building there are 138 Lagoon View Rooms, Junior Suites, Senior Suites, and a Presidential Suite. There are also 12 Overwater Bungalows in front of the resort with views over the lagoon, a great spot for a honeymoon. All rooms have air-conditioning, 24-hour room service, a minibar, and tea and coffee making facilities. La Plantation Restaurant has large themed buffets as well as a Tahitian Dance Show (Friday nights). Le Carre Restaurant is located in front of the Lagoon. Enjoy cocktails at the L'Astrolabe Bar and have a light lunch at Le Pool Bar on your tropical honeymoon. For more about the history of Tahiti, visit the Museum of Tahiti, or visit the Gauguin Museum to view original pieces of art. For a glimpse of one of the largest collections of seashells from the South Pacific, head to the Seashell Museum. If you are looking for a romantic idea, try the three Waterfalls or the Caves of Maraa. Nearby activities include scuba diving, dolphin discovery and deep sea fishing. The resort is a 15 minute drive from Faa'a International Airport (PPT). The hotel can arrange for guests to be met at the airport by van but you must let them know the details of your arrival in advance (+689-470707). 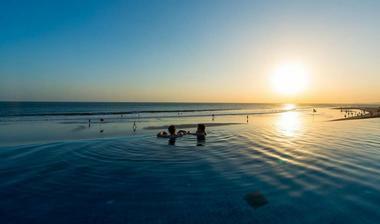 Enjoy great sunset views over the water from the Legian Bali infinity pool which is slightly elevated above the beach, just enough to give you the best view while still making you feel a part of the island scene. Located on the sandy Seminyak Beach in Bali, The Legian is a luxury resort with just 68 romantic suites offering guests the ultimate in pampering and relaxation. Plan a tropical honeymoon, a wedding or an anniversary celebration at this beautiful resort. All of the suites at the resort face the Indian Ocean, offering vacationers great views and salty ocean breezes. Designed by the Indonesian designer Jaya Ibrahim, interiors feature natural fiber furniture, original artwork and Balinese artifacts. Choose from Studio, One Bedroom, Two Bedroom and Specialty Suites, all with balconies and stunning ocean views. Amenities a 32-inch tv, Bose sound system, iPod dock and an Apple Video iPod for use during your stay. The Beach House villa is set in its own walled tropical garden right next to a tranquil stretch of Legian Beach. The luxury villa has an infinity edge pool, complete with sunbathing decks with day beds overlooking the ocean. You can host a party of 50 here, perfect for a tropical wedding or an anniversary. Treatment at this tropical spa are inspired by Balinese healing traditions and innovative wellness therapies. The spa has two single and three luxurious couples spa suites where honeymooners can indulge in relaxing massages, baths and aromatherapy. The spa is equipped with luxurious steam and sauna rooms. Complimentary morning Hatha yoga is offered four times a week. The beachfront restaurant offers picture-perfect views and delicious cuisine accompanied with fine wine and signature tropical drinks. Theme nights at the restaurant feature indigenous dishes from Indonesian Rijstafel, ranging from pork ribs in young jackfruit stew to fresh seafood barbeque. The Indonesian set menu is accompanied by an authentic Legong dance. Have lunch on water's edge at the ocean Bar, serving light dishes. Return for afternoon tea with Balinese sweets and a romantic sunset dinner. Luxury suites at The Legian start at $435 USD per night. One Bedroom Villas start at $595. St. Regis Princeville Resort in Kauai, Hawaii, is a luxury getaway offering five star accommodations and attentive service. Lounge by the pool under the palm trees and ocean views, play scenic island golf and get pampered at the spa. A unique feature of the hotel is the Resort Butler service which includes guest welcome upon arrival, personalization of the guest suite, unpacking, dining reservations and other requests. The resort is located in the 9,000 acre resort community of Princeville at Hanalei which has a golf club and a unique Hawaiian spa. 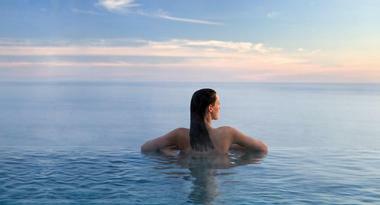 The 10,000 square foot Halele'a Spa has 12 treatment rooms, a 24-hour fitness center and a diverse menu of services. 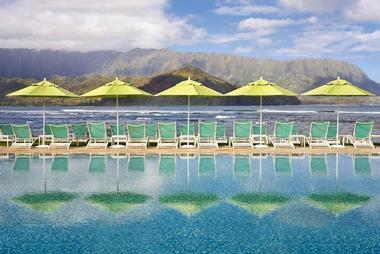 Plan your dream event on the shores of the Pacific Ocean in Kauai, Hawaii. Wedding coordinators at the luxury resort can help you take care of every detail so that you can have a stress-free celebration. Whether you want a small ceremony on the sand or an elaborate ballroom event, there is a venue for every taste and size at the St. Regis. The Grand Ballroom accommodates up to 500 guests in an elegant setting. The resort can accommodate custom themed events, including catering. Rooms at the hotel start at $465 per night. Look for golf and spa packages. Sir Richard Branson is famous not only for his success in business but also for his beautiful luxury vacation properties around the world. Ulusaba in South Africa is a unique vacation destination in the Sabi Sand Reserve. There are just 21 rooms and suites at the resort (in two separate lodges), providing guests with plenty of space and privacy. The accommodations are elegant and luxurious, surrounded by undisturbed views. The property has an outdoor pool and a spa offering a varied menu of treatments. Get an outdoor massage with stunning views of the surroundings. Guests are invited on twice daily game drives and safari walks on 13,500 hectares of wilderness (the property borders Kruger National Park). Expert Trackers bring you up close to elephants, lions, leopards, rhinos and other exciting wildlife. There is plenty of opportunity for amazing photography and exploration. Whether you want to be taken on a private romantic picnic at a secluded location, devour the delicious evening buffet, or have a private dinner under the stars at the observatory, there is plenty of great food. Kids are welcomed with a Cub's Club backpack filled with educational and entertaining items. The resort frequently offers specials where kids stay for free, so be sure to ask when booking your adventure getaway. Rates start at ZAR 5,000 per person per night, including all meals, beverages and transfers from the resort's private airstrip. Villa D'Este in Italy offers vacationers a dramatic view of Lake Como during the day and at night. Villa d'Este is composed of two magnificent palaces that sit at the edge of Como Lake in Southern Italy. Each of the estate's 152 luxury rooms and villas are equipped with large walk-in closets, marble bathrooms, and modern amenities. The accommodations offer guests a prime view of the beautifully landscaped gardens that surround each palace as well as the cobalt blue waters of Como Lake. Villa d'Este has a range of restaurants and bars that are easily accessible from the rooms and villas. A sauna, a large fitness center, and a spa with a long list of soothing treatments are also located on the Villa d'Este property. 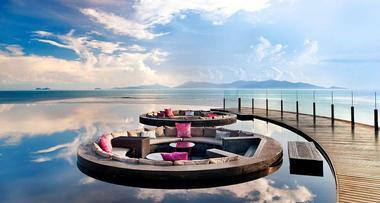 The Lotus Pond at the W Koh Samui in Thailand has round infinity edges and plush circular sitting areas that float in the pool. W Retreat Koh Samui is a beachfront villa hideaway in Thailand, featuring 73 individually designed "retreats" pre-loaded with luxuries such as patios, private pools, designer furniture, ultra plush bathrooms and stunning ocean views. This is the perfect retreat for those who look for luxury and modern style. The smallest Jungle Oasis accommodations measure 1,755 square feet in size, so no matter which layout you choose, you will have plenty of space. The largest house with the best ocean views is the Extreme WOW Ocean Haven, but since it measures 9,602 Square Feet in size you will have to bring your entire entourage to fill it. You may decide to never leave, and who can blame you. But if you do venture out, the resort has a white-sand beach with open ocean views, Away Spa, fitness center and a choice of bars. Take advantage of the Whatever/Whenever service and think up unique experiences that you've always wanted to try. Need unique ideas for a romantic proposal? Call the hotel. How about a specific dish that you want to try? Choose from local, regional, continental or international flavors, coupled with award-winning wines. If you don't feel like going out, private dining and in-room dining services are available 24-hours a day. Other ideas include Picnic Hampers for Couples, Bubbly Breakfasts and a W Deli selection. The property is set on the sandy Maenam Beach on the northern coast of the island. The designed by the MAPS Design Studio, with P49 Deesign interiors. Away Spa has seven treatment rooms and offers unique services such as the Thaimazcal herbal sauna/steam experience. Tonic Bar serves refreshing juices, smoothies and health-conscious light snacks. Beach Ambassadors stand by with lotions, hats and visors as well as a large assortment of equipment such as kayaks, banana boats, surf and boogie boards. Snorkeling and scuba diving are also very popular. Rates start from around $500 USD per night. Look for 3rd night free specials and other packages to save (66-7791-5999). 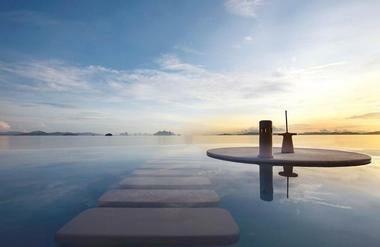 This infinity pool with submerged steps on Naka Island offers views of the dramatic coastal scenery in Thailand. 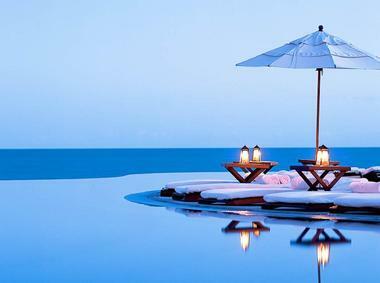 This five-star resort is located on a private island off the coast of Phuket, Thailand. Guests can choose to stay in a tropical pool villa, a sea view pool villa, a beachfront pool villa, or a royal horizon pool villa. Each of the 67 villas combines elements of traditional Thai style with the latest amenities, and breathtaking sea views add to the luxury of this isolated spot. Naka Island has its own spa where guests can receive massages, skin treatments, and aromatherapy. A steam room, sauna, and ice room are also available to visitors. For meals, the resort offers traditional Thai fare as well as western dishes. Guests can also enjoy a romantic private meal prepared by the resort's talented chef.